29 Curzon Street is a Grade II listed office property on the south side of the street with a striking façade covered in Virginia Creeper. A new effective FR&I lease from the freeholder for a term to be agreed. £90,000 per annum. Please note that the building is not registered for a VAT and therefore VAT will not be applied to the rent or the service charge. We are informed that the premises has a Rateable Value of £82,000 but interested parties should make their own enquiries. Fixed at £20,000 per annum for the term of the lease inclusive of heating, lighting, cleaning, lift maintenance and small power. Telephones at the tenant’s cost. 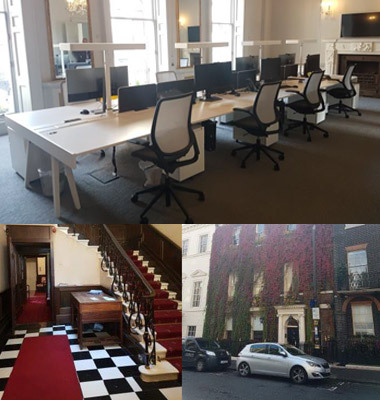 A self-contained period first floor with exceptional ceiling height of over 14 ft (4.4 metres), arranged as two offices, the front of 654 sq ft overlooking Chesterfield Gardens with a smaller office of 378 sq ft to the rear. The suite has just been completely redecorated and carpeted and a newly-fitted kitchen (of 91 square feet) and new wc have been installed. The floor benefits from comfort cooling units and underfloor trunking and a small comms room of 12 sq ft. Furniture (8 dealing desks and chairs, and a meeting room table) potentially available. Curzon Street links Berkeley Square with Park Lane in the core of Mayfair. Green Park is the nearest underground station and numerous bus routes pass close by. The immediate location abounds with top-class restaurants and private clubs, and Shepherd Market is moments away with its eclectic mix of pubs, sandwich bars and restaurants.